Sotheby's says the diamond is the largest and purest of its type. The 102.34-carat gem was mined in Botswana. The auction record for any diamond is held by the "Pink Star," which sold for $71 million at Sotheby's Hong Kong in 2017. A model holds a 102.34 carat white diamond, described as the rarest white diamond ever to come to market, at Sotheby's in New Bond Street, London, ahead of its private sale at Sotheby's Diamonds retail boutique and is expected to fetch in excess of 33.7 million US dollars. A white diamond billed as the largest and purest of its type to come to market is expected to sell for well over $33 million. Sotheby's auction house says the 102.34-carat gem mined from Botswana "is the only known round brilliant-cut diamond over 100 carats perfect according to every critical criterion" — carats, color, clarity and cut. Sotheby's diamond department head Patti Wong called it "over 100 carats of flawless perfection." 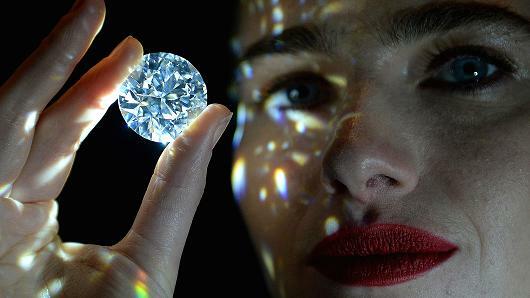 The diamond went on display Thursday at Sotheby's London showroom and is being offered for private sale. It's expected to fetch a price "considerably higher" than the $33.7 million auction record for a white diamond. The auction record for any diamond is held by the "Pink Star," which sold for $71 million at Sotheby's Hong Kong in 2017.